Though Karuizawa was the Road Station in Edo Period (1600-1867) when Shogun had had dominant power all over Japan, the land turned into only small village early in Meiji Period (1868-1912) because the land was so sterile. The cause to revive this land was the visitation of missionary Alexander C. Shaw in 1886. He found this landscape was similar to his birthplace Scottland in respect of filled with abundant nature and pure beautiful air. He loved this land and built his summer house at Daizuka-yama area in the Old City. Then he introduced this place as a beautiful resort to his friends' missionaries and the Japanese intelligentsia. Sooner gradually the summer houses for foreigners, businessmen, novelists, and artists was getting increasing, then simultaneously some churches were built. And now here Karuizawa has become the most famous resort town in Japan. This Karuizawa Union Church informally started her missions in 1897 by missionary Daniel Norman whom people affectionately called "the mayor of Karuizawa" by the local residents. 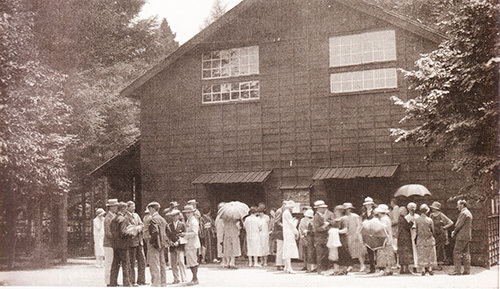 Many Protestant missionaries were the first to build summer cabins and hold Christian services in Karuizawa in the mid 1880's. After purchasing a building originally owned by Japan National Railroad, it was remodeled and reborn as a church in 1906 and a constitution established also at that time. Some of the pioneer missionaries who served in the initial founding of KUC were famed architect Dr. William Merrell Vories, and Dr. & Mrs. A.R. Reischauer, the parents of Edwin Reischauer, former U.S. ambassador to Japan. KUC has a long history of serving as a meeting place for Christian worship services and conferences with world renown speakers, including Kagawa Toyohiko, famous Japanese Christian social reformer, Dr. J. Oswald Sanders and many more. In 2003 we invited Dr. Youngblood, professor of Old Testament at Bethel Seminary, San Diego, who was an executive editor of the New International Version Bible and a member of the Executive Committee on Bible Translation. Activities of the church through the years have included youth retreats, concerts and lectures and many educational services to the community including a kindergarten which started in 1916 and an English elementary school. The church also started and supported for many years Karuizawa Japanese Union Church. KUC had provided facilities for missionary language training, Karuizawa Language School operated by TEAM mission for many years. We continue to serve as a center of evangelism to the Japanese and surrounding community.